The Monadnock region town of Jaffery, New Hampshire was first granted in 1736 to soldiers from Rowley, Massachusetts. The soldiers were returning from the war in Canada, the town was known then as Rowley-Canada. In 1749 it was re-chartered as Monadnock Number 2, sometimes called Middle Monadnock or Middletown. It was one of the first towns established under the New Hampshire proprietors’ purchase of undivided lands under the Masonian claim. The town was regranted in 1767, and incorporated in 1773 as Jaffrey, in honor of George Jaffrey, member of a prominent Portsmouth family. George Jaffrey’s son was a life trustee of Dartmouth College, and designer of the official college seal. Each year the town of Jaffrey holds a town-wide yard sale. The Jaffrey Yard Sale is usually held in early August. 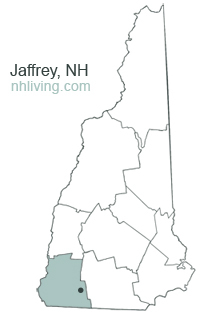 To share any Jaffrey, NH information with us, please contact us. Learn more about advertising in NHLiving.